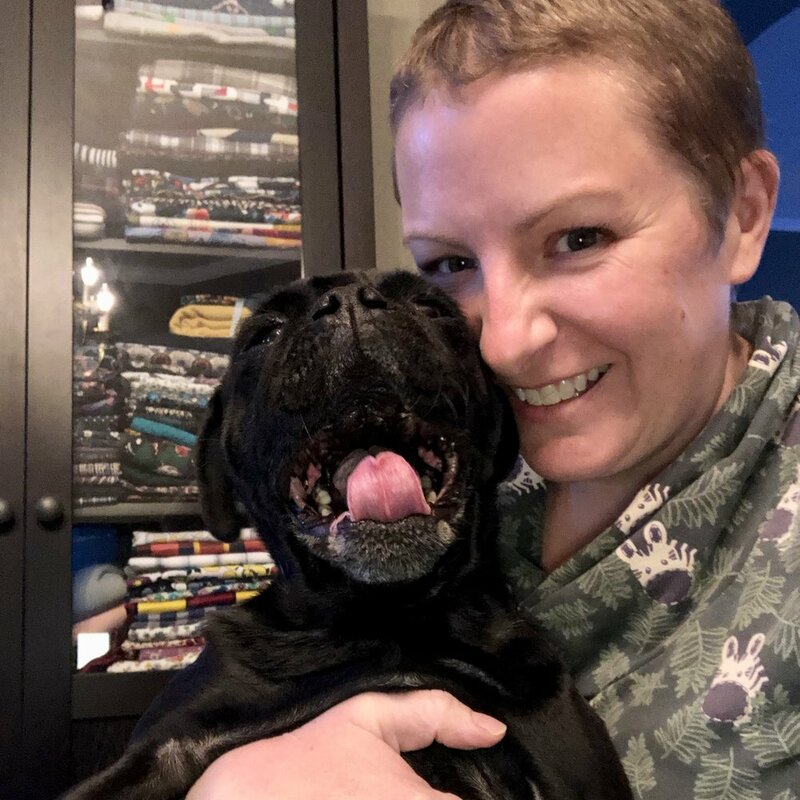 Just another sewing blog but with a touch of pug. Get ready for a pretty picture heavy post guys! I thought I would give the blog an Archer break and share something a little different. Well different for me anyway. The Deer & Doe Chardon skirt and the lovely (what will I ever wear that with, but now I can't live without) Closet Case Nettie! I say a little different because I hardly ever wear skirts (and I have never worn a bodysuit). I'm not sure why I don't really wear skirts, as they seem like a pretty versatile item, but for some reason, I have always thought that they don't really suit me. That being said, I really like this one! I think the highwaisted-ness suits my petite frame and I love the pleats and belt loops too! Plus it has pockets - woo hoo! Hey look, I still have pink in my hair! I've seen a bunch of Nettie/skirt combos popping up online and I thought that a Nettie paired with this skirt would be perfect! I wouldn't have to worry about always tucking in, or that my top was riding up and/or becoming untucked and I think it worked out splendidly. For the Chardon, I used Kaufman Brussels Washer Linen Blend (say that three times fast) from Fabric.com. I think it has the right amount of drape and body and it holds the pleats well. I made a size 44 and I used the length of version A without the contrasting piece - what can I say, I'm short. I used store bought bias tape for the hem and I love how that worked out too. I'm all about the bias tape hems lately. For Nettie I used a striped cotton jersey from Girl Charlee, and I made the version with 3/4 length sleeves in a size twelve. I ended up shortening the bodice by about 1.5" and I did a small sway back adjustment as well. The leg bindings are supposed to be finished with self fabric, but I decided to do something a little different, and I finished them with lingerie elastic. I have never applied lingerie elastic, but I think it turned out pretty well. This pretty pink came from Sew Sassy, and it's super soft and not pinchy at all. I first attached it with a zig zag stitch and then used my coverstitch machine to topstitch it in place. This is the first project I have ever made that involved snaps. And I was a little naive about it. I thought, how hard can it be really? Well...here's what it looked like on my muslin. Snap fail!! (If you follow me on Instagram, you would have seen this already, with the caption Nailed it! My husband didn't understand the reference until I pointed him here. We had a really good giggle, and it still makes me laugh whenever I think about it). I think my first mistake was using a scrap of jersey for the gusset. In my experience so far, setting snaps in jersey and having them look good is really, really hard! I think my second mistake was trying to set them through so many layers of fabric. After doing this, I re-read the pattern instructions and discovered that you are supposed to a) use a woven scrap of fabric, and b) set the snaps through one layer of fabric, then fold it over and stitch. My second try turned out so much better! When it comes to sewing, I tend to be one of those people that refuses to be discouraged by fails. I think you learn so much from your mistakes and I was so determined to master snaps, that I just kept trying. I have a couple more projects to share that involve snaps and I am so happy that I just kept on trying, because the effort really paid off. Hallelujah! Not perfect, but much, much better. You are supposed to slip stitch, but I am way too impatient for hand sewing, and no one's going to see this but me, so I just machine stitched as well as I could around the snaps. It works. My cover stitching looks pretty messy too, but in sewing, it's not what's happening on the inside that counts, it's how in looks on the outside that's most important. Right? Anyway, I was a little bit worried about what I would wear Nettie with, but I think she goes perfectly with skirts and will be a great layering piece during the colder months. She could be worn under cardigans, sweaters, Archers and perhaps even under an Alder Shirtdress. (Btw: Did you hear that Grainline is releasing a new sweatshirt pattern on Monday?? Eeeeee!) I am a little bit confused about how to wear this bad boy when tights are involved though. Do the tights go over or under Nettie? But I'll figure it out I'm sure, it's probably wearer's choice LOL. What have you been up to lately? Have you had any epic fails (sewing or otherwise)? Did it discourage you or were you like me and even more determined to conquer the task? PS: Happy Thanksgiving to all my Canadian peeps!! Hope you get lots of yummy turkey and remember all the wonderful things to be grateful for! Hello! I'm Heather and welcome to my blog. I love pugs, fabric, travelling, and I'm obsessed with sewing. Please have a look around, make yourself at home, and let me know if you need anything. If you'd like to know more about me click here.